Doom metal - the ultimate guide to doom metal music and its subgenres. Doom metal is a slow style of metal music, often focused on heavy, downtuned guitars. The tempos are slow and the music tends to have a bleak atmosphere. The vocals can range from clean, operatic vocals to death metal growls or other extreme sounds. Black Sabbath is considered the first metal band, as well as the first doom metal band. In this article you’ll find my full guide to the genre, including chronological history, subgenres and regional scenes. Beyond this article, doom-metal.com is one hell of a resource for the doom metal genre overall. They have a broader scope, and it’s a very good place to find new, unknown bands. My writing is more biased, and I will be shameless enough to talk about my own band a few times during this article. I hope you’ll still enjoy the ride! If you’re just starting out with the genre you’ll need to know that there are many different subgenres. We’ll go through all those in this main article. I’ll also link out to other articles where you can read more about the different subgenres. Hopefully you’ll know a lot more about the music style after reading this. I’m also hoping you’ll leave the site with some new favorite bands. In short, there are bands in the doom style that reach from terribly depressive to almost feel-good. The genre is merged with everything from progressive and melodic styles to drone, psychedelic and many more. Some bands 15 minute songs with very few chords. Some are a rocking riff-fest. Personal taste disclaimer: I’m more into the extreme styles of doom metal like death/doom. My knowledge of the more Black Sabbath-based styles is limited. I won’t step on any toes, but my band tips will be much more on point in my familar subgenres. The map of doom metal subgenres below is a great package to start if you want to know how the different styles sound. Read more about the death/doom metal subgenre or my doom metal band Soliloquium right here on the site. Black Sabbath’s self-titled track from their self-titled debut album (1969) is almost universally agreed upon as the first doom metal song. It has an occult, eerie vibe to it along with guitars that are very distorted and abrasive for its time. Black Sabbath continued to make both rocking and doomy songs during their long career, but the song “Black Sabbath” and a few others from their early period certainly laid down the foundation for doom metal music. In the 70’s and early 80’s bands like Pentagram, Pagan Altar, Witchfinder General, Trouble and Saint Vitus built Black Sabbath’s foundation. This created styles like traditional doom, stoner doom and epic doom. The first Candlemass album “Epicus Doomicus Metallicus” from 1986 took the music style to a whole new level. Just like the name of the debut album entails, Candlemass cemented the style epic doom metal. It’s definitely my favorite doom album from the old school subgenres. The only competition for me personally in the classic style comes from Solitude Aeturnus. Solitude Aeturnus played a highly Black Sabbath-influenced style, fueled by excellent vocalist Robert Lowe. Incredible riffs and songwriting was merged with a melancholy more common in 90’s doom metal. The second and third Solitude Aeturnus albums are big favorites for me to this day. In the early 90’s extreme metal made its way into the doom genre. British bands like Cathedral, Anathema, Paradise Lost and My Dying Bride merged death metal elements with the melancholy from the doom genre, creating death/doom and gothic metal. The Swedish band Katatonia got on board and created two highly influential 90’s albums before moving on to more contemporary and experimental music. The late 90’s and early 2000’s saw melodic death metal and death/doom merge, resulting in quality bands like Rapture, Insomnium, Slumber, October Tide and Daylight Dies. During that time, the funeral doom genre also grew. This created two extreme opposites of doom; the somewhat energetic and catchy melodic death/doom and the extreme slow, plodding funeral doom. Over the years, some of the doom metal pioneers left the style or made something entirely new out of it. Many bands, like Katatonia, Anathema and Paradise Lost turned to the melancholic, emotional side of progressive rock. More and more bands “demetallized” themselves or became interesting hybrids. Some bands succeeded in creating fantastic music in their new style and others fell. These musical chameleons often retained a recognizable doom mood in their sound. Fantastic alternative, progressive rock and/or post-metal bands like Antimatter, Khoma and Junius emerged. Doom aesthetics also creeped into dark contemporary artists like Anna von Hausswolff and Chelsea Wolfe. Many music style transitions transpired and we’ve definitely wound up with an open environment without clear genre definitions. What about sludge and stoner metal? The sludge metal genre also became popular during the 90’s. Sludge is more about dirty, filthy grooves and harsh feedback, but there’s certainly a strong bluesy Black Sabbath influence in its essence. Some people liken it to doom, or include it in the genre tree. I understand the reasons, but I see it as a phenomenon of its own. I’m personally not big on traditional sludge metal, but I do love atmospheric sludge. What the hell is that, you naturally ask? Read about that in my guide to the 20 best atmospheric sludge metal bands. It’s a pretty exciting subgenre for sure! Speaking of borderline genres: some people also include classic stoner metal and stoner rock bands like Kyuss and Sleep under the doom metal umbrella. I’m not so sure about that. What about the traditional styles? The traditional doom styles also stayed alive during all this time. Candlemass went through several eras with different vocalists, mostly producing quality albums all the way through the 90’s and 2000’s. Many revivalist or highly traditional doom bands also came along in the 2000’s, such as Krux, Sorcerer and Witchcraft. There are also some more melodic-sounding modern doom bands like Isole (I know they’ve been around a long time, but still modern in comparison), 40 Watt Sun and Pallbearer creating quality music. I’m not crazy about some of the more obvious Black Sabbath worshippers. There’s a lot of stoner fuzz that really doesn’t make sense to me. This includes highly popular bands like Electric Wizard and Windhand. One of my favorites in this ballpark is Elder, a psychedelic band with an organic, pretty proggy approach to stoner. The band is hard to define, but doom is certainly a part of their sound. Elder sure can rock too, though. In 2019, it really is a diverse genre where anyone can find a band they enjoy. Let’s move on to my essential bands and my subgenre guides. My guides to stoner, traditional and epic doom may not be as awesome as the ones to the extreme styles, but I bet you can find some cool bands in there. Read this article if you want to see my favorite doom albums from 2019. This is a mix of classic bands and personal favorites that’s a solid list of essential doom metal bands. Keep reading to learn more about the different doom metal subgenres and the many quality bands playing them. There are several doom metal subgenres with vast differences in style. The genre gradually branched out and connected with several other metal styles in the process. 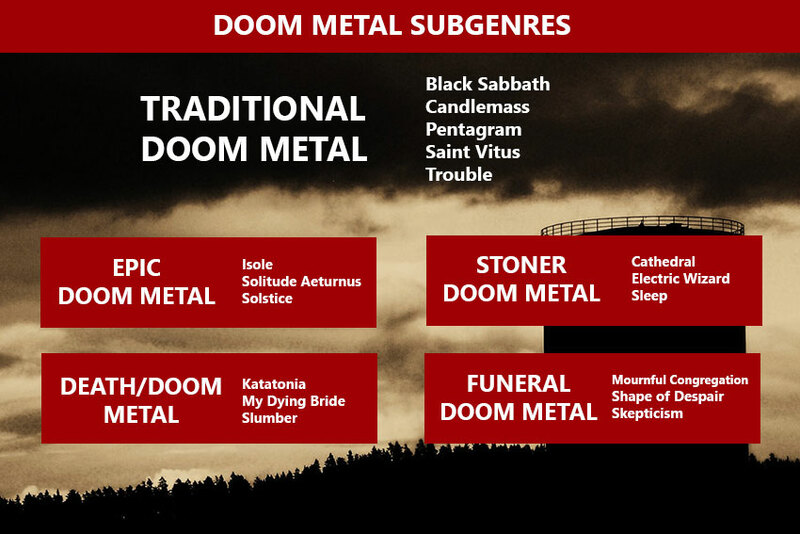 Here is a quick breakdown of some of the central doom metal subgenres. Click to learn more about a specific subgenre. Traditional doom metal is rooted in classic heavy metal. The style emerged in the 1980’s, heavily influenced by Black Sabbath’s early output. Some well-known traditional doom metal bands are Saint Vitus, Candlemass, Trouble, Witchfinder General and The Obsessed. Epic doom metal has a soaring, powerful and operatic approach. 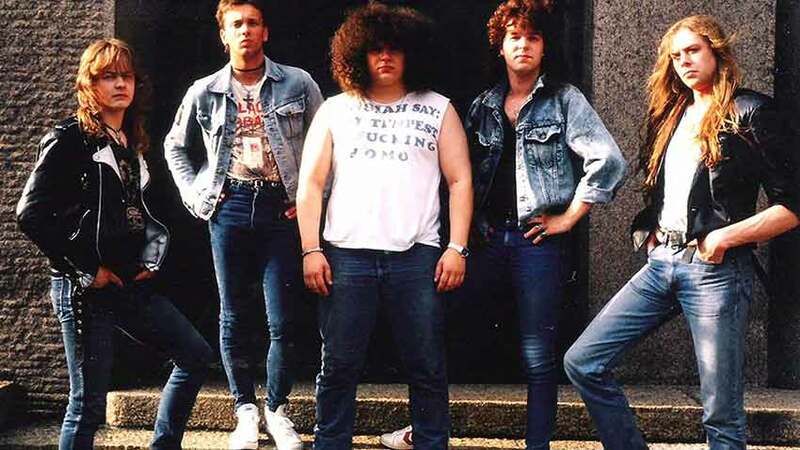 The blueprint for the style is found in the early Candlemass material. Bands like Solitude Aeturnus and Isole built on that foundation in the 90’s, creating the epic doom metal style. Stoner doom metal goes all in on the fuzzy, psychadelic side of Black Sabbath’s music. There is usually a lot of guitar effects and sonic experimentation. Some famous bands in the stoner doom metal style are Electric Wizard, Sleep and Cathedral. Funeral doom metal is one of the slowest and most dirge-like styles of doom metal. The songs are often long, drawn-out and filled with melancholy. There is usually not much going on in terms of rocking riffs or instrumental flair. Some of the most known funeral doom metal bands are Shape of Despair, Esoteric, Skepticism and Mournful Congregation. The death/doom metal style emerged in the early 90’s. It merged the blooming death metal scene with doom metal aesthetics, creating a new subgenre. Essential death/doom metal bands include Paradise Lost, Anathema, Katatonia, My Dying Bride and Amorphis. There are also modern classics by bands like Slumber, Daylight Dies and Rapture, as well as newcomers like Ocean of Grief and Lying Figures. Black/doom metal is a style of music that combines black metal and doom metal. The black/doom metal genre spectrum is that one that’s often combined with other genres and subgenres like death/doom metal, depressive black metal, atmospheric black metal and blackgaze. Shining and Forgotten Tomb are two obvious bands to mention, as well as early 90’s Katatonia. There are some countries that are especially good at producing doom metal music. Some regional scenes were central to the genre’s evolution, and others simply produce quality doom metal. Finland is a dark country that naturally produces a lot of dark music. The Finnish doom metal output ranges from traditional doom like Reverend Bizarre to death/doom and funeral doom. I think the many good death/doom bands capture the Finnish darkness the best. Check out Hanging Garden, Kaunis Kuolematon, Rapture, Shape of Despair, Skepticism and Swallow the Sun for a solid dose of doom. Don’t miss Barren Earth, Black Sun Aeon and Insomnium if you’re into melodic death/doom, another Finnish speciality. If you’re intersted in Finnish metal music overall, check out my 50 best Finnish metal bands blog post. Sweden’s doom metal scene gave us Candlemass, but there is also plenty of quality music to be found in the 90’s and 2000’s. My two favorite death/doom albums are from Sweden (Katatonia’s “Brave Murder Day” and Slumber’s “Fallout”), and there are many newer bands that play quality doom metal as well. Isole play epic doom with a modern twist. Krux is a solid Candlemass spinoff with downtuned guitars. October Tide, Draconian and DOOM:VS are all good bands from the more death metal side of the doom spectrum. Enshine provides a worthy succession to Slumber with it’s more spacy, shoegazy take on the sound. Except the obvious fact that the U.K. gave birth to doom metal through Black Sabbath, the scene was instrumental in creating the death/doom metal style. The “Peaceville Three” (Anathema, My Dying Bride and Paradise Lost) emerged in the early 90’s and layed down the foundation for the subgenre. 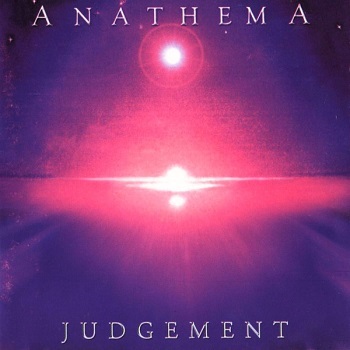 Anathema and Paradise Lost soon left the genre behind, only to keep producing classics in other musical styles. The Crawling (death/doom) and Monolith Cult (traditional doom) keep the quality high in the new millennium. The U.S. had bands like Pentagram, Solitude Aeturnus and Saint Vitus in the past. Today there is a variety of good bands from the U.S. in different doom metal subgenres. Daylight Dies is a particular gem for me, delivering some of the best death/doom ever written. Absolutely essential band! There are also other notable death/doom bands from the United States like Woccon, Atten Ash, Novembers Doom and Evoken.